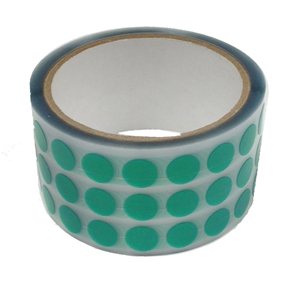 Green Masking Discs, also known as Powder Coating Masking Discs, are made of 2 mil thick polyester film with 1.5 mil thick silicone adhesive. They are extremely economical and can be removed cleanly without leaving any adhesive residue. Green Masking Discs are on a clear, slit back liner for easy removal. Temperature rating is 400°F/204°C. They are packaged in a 3" core.